Do you want to make an exact replica of a 16th-century carved table? Perhaps, an armchair in carved oak? Maybe, a misericord seat or a 17th-century chair. What about an Italian cassone or coffer, or an ornate 19th-century pipe rack? This book will show you how to make these and many other projects. The book combines practical instruction with numerous photographic illustrations and working diagrams. 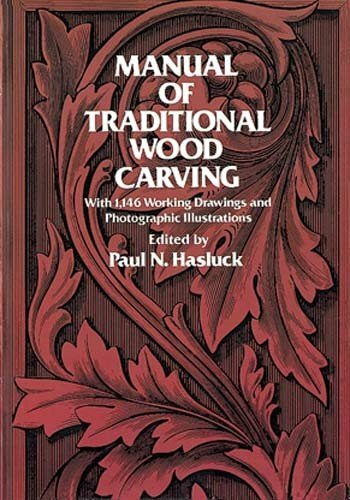 The summation of years of research and practical work, this volume is the definitive work in English on the craft of traditional wood carving. For the serious-minded beginner, the instructional content is well-organized, easy-to-follow, and very precise. 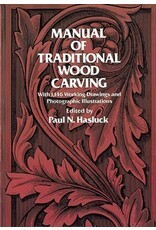 The authors begin with the basics: what tools and appliances are necessary, what woods to use, instruction in the actual cutting of wood. There are chapters on how to translate your ideas into wood, how to design, trace or outline your project. The various methods of practical carving are described; incised, pierced, and chip carving; carving in the round; Gothic carving; styles of carved ornament; etc. Many specific projects are offered: from the simplest — small boxes, bread platters, chests, chairs and stools — to the more complex — tables, cupboards and cabinets, beds, sideboards, even staircases, or for that matter, almost any item you can imagine in wood. Authoritative, complete, and profusely illustrated with 1,146 working drawings and photographic examples, it contains a wealth of encyclopedic information. There is much here you could find nowhere else.Reprint of Cassell's Wood Carving, 1911 edition.